Just it was revealed earlier, the merit between Ronaldinho and Ac Milan might just reach a new chapter especially should the Brazilian ace agree to renew his contract deal with the Rossoneri. After reports saying that the Italian giant are preparing to extend the former Barcelona’s star playing time at San Siro until 2014 with a wage reduction, the latest news stated that Dinho wants an assurance before accepting the offer. 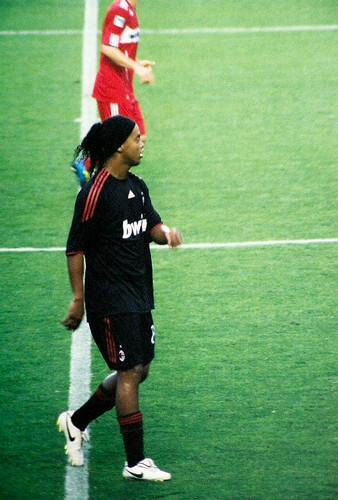 Italian paper, Corriero Dello Sport, believes that Ronaldinho would agree to continue his adventure with Milan and have his wages cut only if the fashion capital club can promise a competitive squad that can help him bring titles to Via Turatti. This surely would be something refreshing for Milan fans, considering the player that provide such an important contribution last season, is hungry for titles and want a clear exciting projects should he decide to stay. Now everything could rely on the rossoneri’s vice president, Adriano Galliani’s, decision as how would he convince the Brazilian that Milan is on the right track to challenge for important trophies again starting from next summer. Reports also claim that, the Milan’s management are seriously considering to look for ammunition that will help the team’s course and currently eying to bring reinforcement up front and also in the midfield area. Despite Galliani’s previous statement saying that Milan will only buy players should someone leave, Ronaldinho’s request might just push things up for the Rossoneri’s management to get their act together as the Brazilian could still reject the agreement as nothing has been signed yet. With offers from clubs back home and also MLS’ LA Galaxy knocking, the ex-PSG player could just opted to take those options if he felt playing in Milan won’t bring him anymore silverware to challenge for.